These proud people are not asking for a hand out, just a hand up. 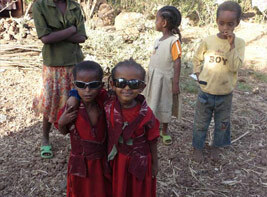 This is the eighth newsletter highlighting our recent trip to Bahir Dar Ethiopia. As with previous years our friend Jane came away with us. Unlike other years we found ourselves going later in the year, setting off in April on Maundy Thursday. The journey as ever was arduous with seven packed bags between us with a combined weight of 161 kg, taking out much needed supplies as well as a fantastic donation of pens, books etc from St Cedd’s School, Bradwell-on-Sea. Oh, forgot to mention 180 party bags along with the associated gifts, will explain more later. With inflation close to 40% the cost of basic food this year was a shock and we had to prioritise the funding we took out. We found that this year we had to help out with supplying food and also funding rent. Tef, the staple grain in the Ethiopian diet, is up 50% on last year and sugar used in the porridge milk is almost impossible to buy and when we did it was very expensive. The only blessing was the strength of the Pound. Previous years we have had houses built but these are now about £250 as the cost of materials had also risen in price and because of this we made the decision not to build this year. We have twenty families on the current list who are in desperate need of a house or repairs to their existing home, and we were very disappointed not to be able to help these people, hopefully next year we will have the money. The raising of funds this year has been difficult as the economic problems of the world impact on everyone home and abroad. We raised less money this year but were still able to help many people and hopefully make a difference in their lives. Once again many thanks to those of you who continue to support the people of Bahir Dar. It seems no matter what life throws at these people they always smile and the welcome and hospitality we receive each year is awesome.